In many games of chance the odds of winning or losing remain constant during play, such as in the street coin-game Two-Up and for the casino Roulette wheel. At the other extreme, the odds of winning are sometimes determined by the players to a much greater extent, such as in the card game Poker. This is why poker is such a popular form of gambling — all players are under the delusion that the advantage lies with them alone. In between these extremes, there are games of chance where the odds of winning vary depending on the circumstances. If a player can identify these circumstances, then they can increase their wagers when the circumstances are favorable and decrease them when they are unfavorable, thus maximizing their chances of making a profit. This is called Advantage Gambling, and it is amenable to formal mathematical analysis. These analyses have kept a number of mathematicians gainfully employed over the centuries. In blackjack the player is betting their card hand against that of the dealer (not any other player). The basic idea is to be dealt a hand of cards whose face values sum to a final score that is higher than that of the dealer's hand without exceeding a sum of 21. There are many variants throughout the world, although they tend to be minor variations on a single basic theme (as described by Wikipedia). In general, the dealer follows a strict set of rules specifying how many cards they can be dealt, while the player has a free choice regarding their own hand. Clearly, the composition of the cards being dealt must change throughout a series of hands being dealt, because the deck of cards (or more usually several decks) gradually becomes exhausted. If the cards have been shuffled so that the random order of the cards is very even then there will be little change in composition through time, but if the random order is clustered (as it can be by random chance) then the composition of the cards remaining to be dealt may favor either the dealer or the player. This favoritism happens because the dealer has to follow a fixed strategy, and certain cards favor that strategy. In particular, the dealer must always be dealt another card when their hand sums to a total in the range 12-16 (and sometimes 17). If the card dealt is a 10, J, Q or K (all of which have a value of ten) then the dealer's sum will exceed 21, and the player will win. Thus, if there is a high proportion of these cards remaining in the deck then the dealer is at a disadvantage relative to the player, who can chose not to take the extra card. On the other hand, if there is a high proportion of low cards remaining (especially 4s, 5s and 6s) then the dealer will not be disadvantaged. In general play, the casino dealer will have an advantage of 0.5-1%, depending on the precise rules of play and how many decks of cards are in use simultaneously. So, in the long term the casino will make a profit, which is why they are in the gambling business in the first place. 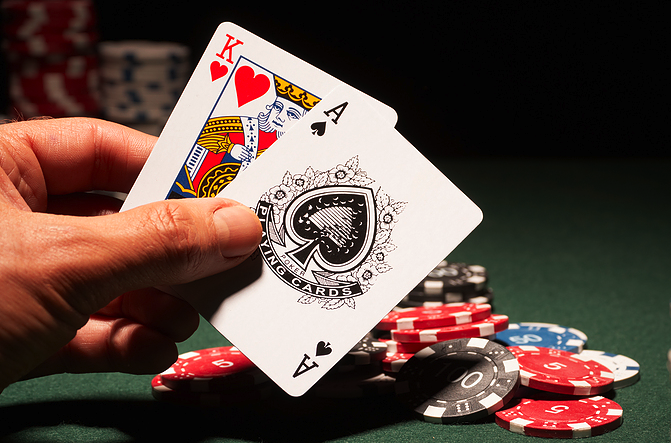 However, they make a smaller profit from blackjack than from any of their other games (for example, in roulette the casino's advantage is usually 5.3% in the USA and 2.7% in Europe), and this means that for blackjack the advantage gambler doesn't have to move the advantage very far for it to be in their favor instead of the casino's. There is a Basic Strategy in blackjack, which stipulates what the gambler should do when their hand has any specified total against that of the dealer's — that is, whether they should Stand, Hit, Double Down, or Split. This was first explained by Roger Baldwin, Wilbert E. Cantey, Herbert Maisel and James P. McDermott in 1956 (Optimum strategy in blackjack. Journal of the American Statistical Association 51: 429-439); and Wikipedia provides a simple exposition. For the gambler, this strategy will lose the least amount of money to the casino in the long term (ie. lose only the 0.5-1% referred to above), as determined by mathematical analysis. The advantage gambler wants to change these odds. The most common advantage play for blackjack is card counting, and it can change the advantage to be up to 2% in the gambler's favor. The essential idea is to keep a running track of whether the remaining undealt cards are biased towards small values (2, 3, 4, 5, 6) or large values (10, J, Q, K, A). To do this, a pre-specified value is added to the running total for each of the small cards that have already been dealt (and therefore can't still be in the deck), and a pre-specified value is subtracted for each of the large cards. The value of the running count will then indicate how much the advantage is in favor of the gambler. The gambler can then bet according to the size of their advantage. There is nothing unique about this: "anyone who aspires to play Bridge, Stud Poker, Rummy, Gin, Pinochle, or Go Fish knows that you must keep track of the played cards" (Norman Wattenberger. 2009. Modern Blackjack: an Illustrated Guide to Blackjack Advantage Play). It requires no especial mathematical ability, although you do have to pay attention, and not forget what your count currently is (this is far simpler than playing bridge, where to play well you need to keep precise information about the remaining cards). Blackjack has apparently increased in popularity over the past 40 years because it is one of the few casino games that can consistently be won using expert play (maybe also video poker). However, the casinos will not unexpectedly try to stop you from winning via card counting. The idea of counting cards in blackjack has been around since at least the 1950s, but the first popular text on the subject was Edward O. Thorp's book Beat the Dealer: a Winning Strategy for the Game of Twenty-One (1962). Since then, oodles of card counting systems have been devised, which differ in how many points are to be added to or subtracted from the running total for each card that is dealt. They range from relatively easy to implement to unnecessarily difficult. This trend correlates quite well with the perceived ease of use of the systems, with the hardest ones to use being highlighted in red in the network and the medium ones in blue. The hardest ones do seem to be the most successful at predicting good betting situations. However, the consensus seems to be that the most complex systems are not that much better than some of the simpler ones — these are slightly less powerful but far easier to use. That is, the differences in difficulty are much greater than are the differences in performance, and so the complex ones are rarely recommended these days. The powerful but simple systems include KISS III, K-O, REKO and Red Seven. Indeed, K-O appears to be becoming one of the most popular card counting systems. However, the older Hi-Lo is probably the most used counting strategy in existence. Actually, consistently winning at blackjack is now old hat. What is far more interesting is trying to be an advantage gambler at games like lotto and the lotteries. Advantage gambling at lotto turns out sometimes to be an investment strategy rather than a gamble. For example, there have been times when the prize money has actually been greater than the cost of the betting tickets required to cover all of the needed number combinations (see The International Lotto Fund) and other times when the prize distribution has made each ticket worth more than it costs (see Massachusetts' Cash WinFall). My favorite, though, is trying to work out how to use advantage gambling for scratch lotteries, the gambling that usually has the worst chance of winning (see this article about Joan Ginther, who has clearly tried). Events of the Bible history were also reflected in decks of the playing cards. The Church did not approve cards and the artists who chose Bible scene as subjects of their works, found an interesting interpretation of symbols of card suits. Really interesting. I had no idea there could be a scientific aspect to gambling!